When Miranda Hart tripped over the nation's funnybone and fell face-first onto our TV screens in her eponymous situation comedy back in 2009, taller, accident-prone, socially awkward thirty-something ladies across the land breathed a happy sigh of relief; it was suddenly ok to be that way. 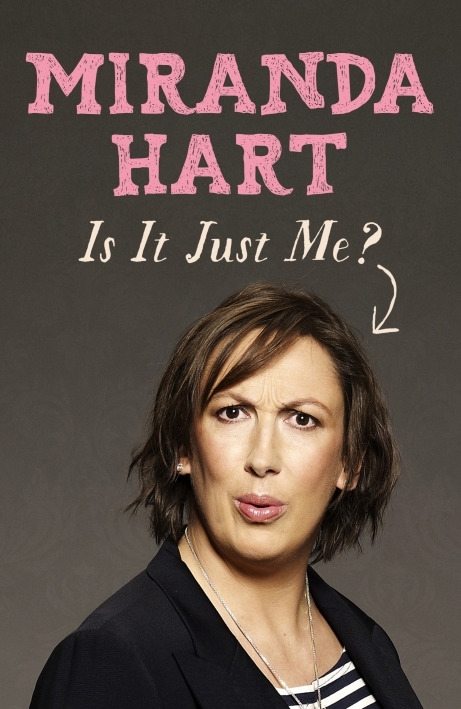 Filling the comedy gap between the second and third series of the show, Miranda Hart has written her first book, Is it just me?. But is it just us, or is it not really all that? Hart is a very talented lady, there's no doubt about it. Back in 2008, Miranda Hart's Joke Shop was broadcast on BBC Radio 2 and then developed into her TV show, Miranda, which went on to win awards aplenty (at the British Comedy Awards in 2010 and 2011, and at the Royal Television Awards in 2011). She's also put in some award-winning dramatic performances in Call the Midwife. Now, her first venture into book writing has landed her the Non-Fiction Book of the Year award at the National Book Awards. In the run-up to its publication, those clever publishing peeps at Hodder & Stoughton set about harvesting Miranda fans' own gaffes and slapstick moments via the magic of Twitter to launch a free ebook, No, it's us too!, to whet fans' appetite for Miranda's own offering. Though mildly entertaining in places, it isn’t nearly as good a read as Is it just me?, which isn't saying overly much. Much like the TV show, the book is semi-autobiographical. Here though Miranda systematically tackles a number of difficult areas of a modern woman's life, from technology to diets to pets, offering sage advice and slapstick moments as she goes. There are reflections on moments in Miranda's life (what she calls 'life lessons'), lists of top tips, positive affirmations and tasks typically in the vein of 'here is a hilariously inappropriate thing I've said I did and we had a little chuckle about earlier, why not try it yourself!'. It feels a little like, in relating these personal stories, Miranda is putting it out there that it's ok to not be entirely normal. Indeed, there is a glorious message running throughout, that the main job in life is accepting yourself and feeling comfortable in your own skin. It's a sort of comedy self-help book. Like the TV show, the book is chock full of slapstick antics. Some of these seem to stretch the bounds of belief somewhat, leaving the reader wondering, is it even just Miranda, or is she surrounded by a comic energy field that somehow amplifies her most embarrassing actions? The likes of D:Ream-y Professor Brian Cox might find some of the physical mishaps – like a prawn being projected from her plate to hit a fellow diner in the eye, depositing a whisker, then falling in their cappuccino, or walking out of a loo with an entire loo roll billowing over people's heads – laughable, but only due to their remote physical plausibility. Hart's voice is audible in the prose. She addresses the reader as 'my dear reader chum', which she abbreviates as MDRC, and which quickly becomes wearing. Adult Miranda narrates but converses with her 18-year-old self every now and then to illustrate how what she thought she, and life, was all about then is quite different to now. These slightly schizophrenic exchanges, a little reminiscent of the time-travelling protagonist in Q: A Love Story, are irritating for at least two reasons. First, whenever 18-year-old Miranda gallops onto set she does so in a flourish of bold italic type, which is somewhat jarring. Second, it feels like a rather convenient way to fill up a sizeable chunk of the 323 pages (in its hardback form). On the plus side, these exchanges contain many a reference to gems from the eighties such as from the golden age of Neighbours, which might be all to the good considering the current zeitgeist for all things retro. All in all, it's amusing enough and has a good heart, but seems overly long and wears a bit thin at the end. All but the most die-hard fans of Miranda might feel the slightest pang of disappointment in this read, as they might on doggedly sitting through the third series of the show on the merits of the first two. As her on-screen mother might ironically say, "such fun".